The Pink Fireman wasn't always pink. Wait, what? What do you mean he wasn't always pink? No folks, The Pink Fireman didn't get his bright pink colors until April 2011. Before then, The Pink Fireman was... well a fireman. The Pink Fireman, also known as Marshall Moneymaker, is a retired career firefighter for Montgomery County Fire and Rescue Services (MCFRS) in Montgomery County, Maryland. Marshall aspired to be a fireman since he was young; looking up to his Uncle Jimmy B. who was a long time, old school fireman. Marshall joined the firefighter cadet program while attending Damascus High School, and slowly worked his way through the system until he was hired by MCFRS in 1998. It wouldn't be long before Marshall landed at Station 6, at the intersection of Wisconsin Avenue and Bradley Boulevard in Bethesda, Maryland. When three of Marshall's sisters shared they had breast cancer, Marshall took the news hard. He was angry, confused, and regretful at times, but most of all he was sad; sad to face the reality that he would lose three sisters to breast cancer. ﻿ Nevertheless, Marshall's fire department shift stood by his side. Despite missing meals, secluding himself from his shift mates and terrible mood swings, 6B-shift kept a weathered eye on their fellow shift mate. After Vicky (2/2008), Penny (6/2010), and Valessa (9/2010) passed away, Marshall found a ray of hope when a breast cancer walk used his fire house parking lot as a pit-stop one brisk September day. Amazingly enough, after all Marshall had been through, Marshall's shift didn't hesitate a minute to pitch in and join in supporting the walkers as they passed through. ﻿The pink faded from the parking lot after that September weekend, but not from Marshall's heart. Over the next few months, Marshall's shift would watch Marshall evolve into a... well... turn into a... ummm... well just turn PINK! ​In February 2011, his shift and their families continued to show support for Marshall and for breast cancer awareness by attending a local Bowl for the Cure Event. Marshall was decked out in pink from head to toe - not as The Pink Fireman - that would come later! Not long after the Bowl for the Cure, Marshall's wife received a call from Marshall's captain. Retired Chief Gaddis from Bethesda, along with MES representative Bill Dunn, came up with the idea of presenting Marshall with pink fire fighter turnout gear. The Chief and company, along with Marshall's shift wanted to surprise Marshall with all pink gear and a matching helmet, to recognize his efforts towards raising awareness about breast cancer. 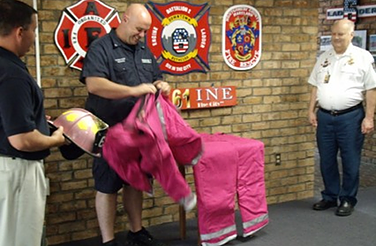 In April 2011, in front of the media, family, co-workers, and shiftmates, Marshall was surprised with the pink gear thus becoming The Pink Fireman. Thanks to the early support of Marshall's shift, Chief Gaddis, Bill Dunn, MCFRS, and the IAFF, The Pink Fireman has become a true life hero for many who have been affected by breast cancer. Marshall has embraced his pink alter-ego and does all he can as The Pink Fireman to raise awareness, and support men and women fighting and surviving breast cancer. A very special thank you to our friends who made The Pink Fireman possible: Captain Marc Worton and the amazing B-shift, Chief Gaddis, and Bill Dunn.